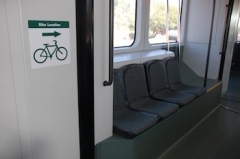 METRO light rail wants your input on bicycle accessibility and integration on its trains and stations. Take this two-minute survey. Increasing bike integration with the METRO light rail system will serve to expand the catchment areas in the first and last miles of travel. This will help to accommodate the growing demand of bicyclists and pedestrians, and will effectively grow METRO into a more complete and accessible system. METRO light rail is looking for your feedback. If your commute involves biking and riding METRO light rail, please take this quick two-minute survey. Click this link or the picture to get started.